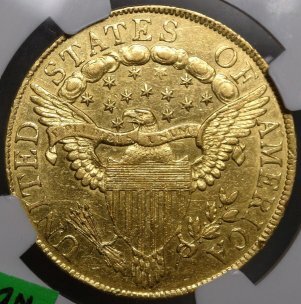 1801 U.S. $10 Draped Bust Gold Eagle Genuine AU Details (NGC)... Take a close look at our photos and check out what NGC identified as repaired. 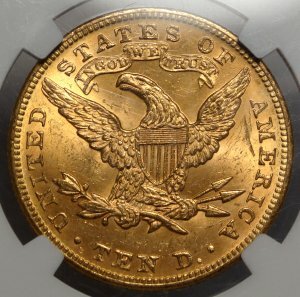 At one time, probably in early 1801 to 1820, collectors commonly lightly etched their first and last initials into a collection center piece such as this coin. We suspect that is what took place with this coin. The repair work was superb and the coin is in beautiful choice almost uncirculated (AU58) condition. 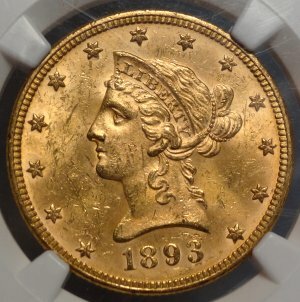 We usually will not buy coins of this nature, however, one look was all it took to sign us up. Its that nice and is priced at 50% of what a perfect coin would cost you. 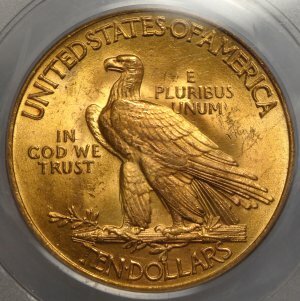 Even coins with relatively minor problems such as this one transact at $13,000 to $14,000 dealer-to-dealer, but we are able to offer this at a significant savings. 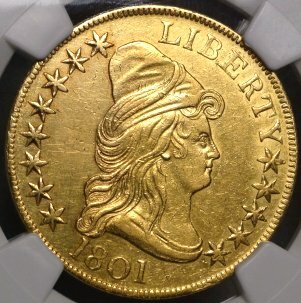 1893-P U.S. $10 Liberty Head Gold Eagle MS63 (NGC)...blazing mint luster front and back! 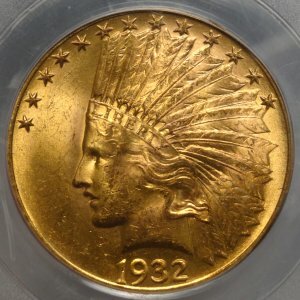 1932-P U.S. $10 Indian Head Gold Eagle MS63 (PCGS)...From our collectors cabinet.